Defence Force Brent Sam attempts to dribble past Morvant Caledonia Travell Edwards in a First Citizens Cup semifinal at the Hasely Crawford Stadium, Mucurapo, Friday. CENTRAL FC and Defence Force will meet in the final of the 2018 TT Pro League’s First Citizens Cup after contrasting results in Friday’s semi-final doubleheader at the Hasely Crawford Stadium, Mucurapo. Central FC needed kicks from the penalty spot to eliminate Police 7-6, after the scores were locked at 1-1 at the end of regulation time. 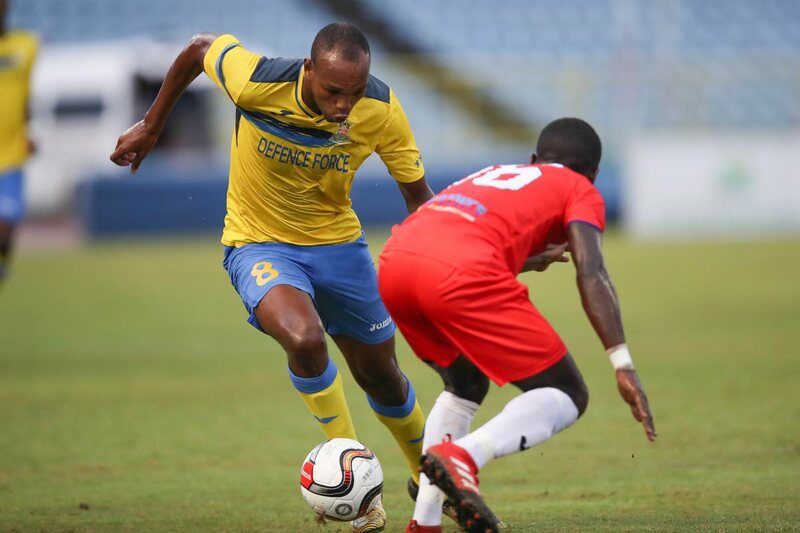 Earlier, Defence Force spanked Morvant Caledonia United 4-0. The final will take place at the Hasely Crawford Stadium on July 20, and it will be a rematch of their June 22 group stage encounter, which saw Central prevail 2-1. In the Central FC-Police penalty shootout, the scoreboard read 4-4 after five attempts from each team. Kerry Baptiste, Anthony Wolfe, Keron Cummings and Akim Armstrong scored Central’s first four efforts, but Duane Muckette’s shot to seal victory was saved by Police goalkeeper Adrian Foncette. Todd Ryan, Kurdell Brathwaite, Ryan O’Neil and Kareem Freitas were on target for Police, but the fourth effort from Clevon McFee was denied by Central goalie Marvin Phillip. With sudden-death penalties required, Taryk Sampson, Dwight Pope and Jared London converted their efforts for Central; Dexter Alleyne and Keion Wilson netted for Police, but Kareem Perry’s attempt was saved by Phillip. In the 12th minute of play, Freitas had put Police in front with a neatly-placed header to the left of a flat-footed Phillip from a right-sided ball by Kareem Perry. Central FC had chances to level the scores but Muckette was noticeably wasteful with his effort on goal in the 31st. Muckette was picked out by right-back Kaydion Gabriel but he skied his right-footed effort. Freitas, after his 45th minute shot was blocked by the defence, fed Christon Thomas who sent his shot inches overbar. Central FC equalised through Muckette in the 70th, as the midfielder slotted the ball into the net to the left of Foncette, after good work on the left by the veteran Wolfe. The lawmen had good opportunities to get the winning goal, but Freitas (88th) and Wilson (90th) missed glaring chances, which came back to haunt them in the penalty shootout. In the Defence Force vs Morvant Caledonia clash, winger Brent Sam scored twice for the Army-Coast Guard combination in the 42nd and 83rd, and there was a goal apiece from central midfielders Hashim Arcia (29th) and Jerwyn Balthazar (81st). Reply to "Central FC, Defence Force in First Citizens final"